If you like colorful backgrounds and borderlines this is the template for you. With all that is happening visually in this style it is very popular the full width bars make nice additions too. Your name and the section headings are held inside a full width colorful background. Each colorful background is surrounded on the top and the bottom with full width borderlines. Your name is first, then your contact information is split up with half on the left and half on the right. All the dates are on the right. If you need a template that will "stretch" your education and employment info this would be a good choice. Style twenty is similar, but it spaces out the sections a bit more than this one. It might be a better fit if you are short on things to write down. Trying a bigger font size or a font that has more spacing between the letters can help too. 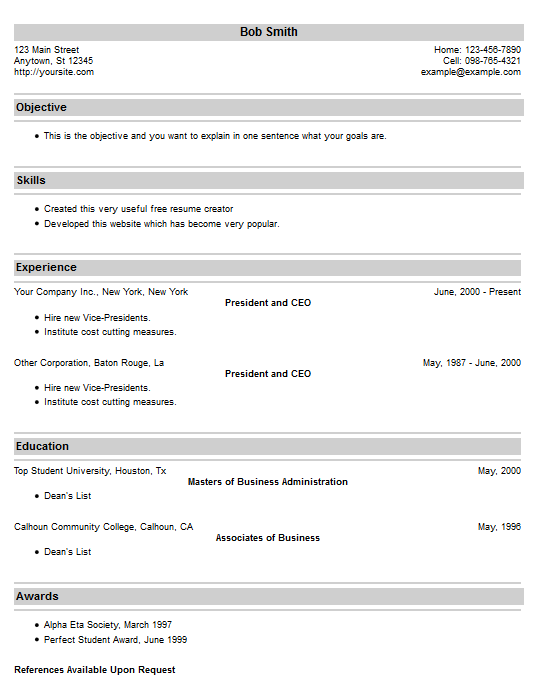 Build your resume with our creator then download it when you are finished. There are no payments or credit cards needed it is free of charge. The link to the creator can be found in the navigation menu on the right above. Be sure to make use of the help that is presented on each page to make full use of the program. Special tips are marked with lightbulbs to bring attention to their presence take extra care to read their messages.